In 1970, comics fan Shel Dorf organized a three-day gathering in San Diego at the US Grant hotel as a fringe gathering for the most enthusiastic amateur comics fans, aspiring artists and writers to interact with comics pros. It drew 300 fans. This was the backdrop against which young Morgan Spurlock grew up in West Virginia, passionately consuming comics and horror films, transported to a different world where everyone was a little bit askew and “weird.” “I wasn’t just a fan,” Spurlock remarks. “I was addicted.” It wasn’t until 2009 that he was able to make his first amateur journey to Comic-Con International San Diego, by now a cultural juggernaut regularly drawing over 150,000 fans, amid a vastly changed (and comics-cultural) landscape. Nevertheless, Spurlock was thrilled. He ran into boyhood idol Marvel animator Stan Lee, and thanked him for all the confidence and creativity he helped to inspire. Stan’s response? “Let’s make a documentary about Comic-Con!” And so, gathering forces with Lee, sci-fi cult icon Joss Whedon, among others, Spurlock embarked on a two-year journey that captured the 2010 Con (the 40th Anniversary edition) in all its glory—including panels, parades, photos, costumes and interviews with notable celebrities that have turned passions into professions. Most of all, however, Spurlock captured the fans. 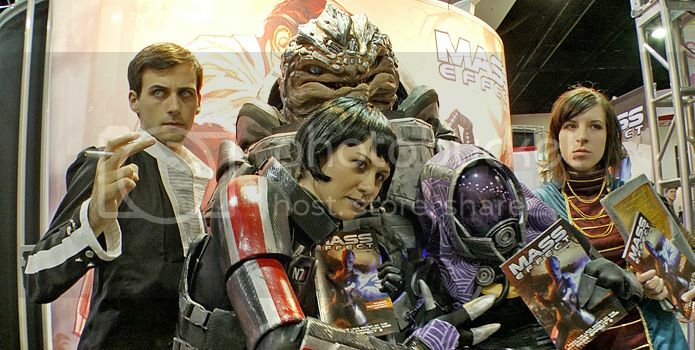 Costume designer Holly Conrad with her team on the convention floor exhibits at the 2010 San Diego Comic-Con. To winnow down the most compelling stories for the documentary, Spurlock held a casting call online that drew thousands of submissions. Among them was Holly Conrad, a talented, award-winning costume designer from a small town hoping to win the grand prize at the annual Comic-Con costume show. Knowing her slim odds, especially because of where she comes from, and the importance of making a splash for her career to take off, Holly called Comic-Con a “suicide mission for her future.” Also in a pressure cooker was Chuck Rozanski, proprietor of Mile High Comics, Americas largest inventory and dealer of comic books. Chuck uses the hectic, chaotic, crowded Comic-Con exhibit area to sell rare and collectible comics, comprising a substantial portion of his company’s income for the year, but faces a more fractured Con, with a smaller focus on comics every year. If he doesn’t make a killing at this year’s Com, Chuck knows the future of his whole business might be at risk. Sharing the convention floor with Chuck are comics-obsessed bartender Skip Harvey and US Airforce pilot and family man Eric Henson, two amateur graphic artists also putting their destiny on the line in San Diego. Armed with only a portfolio and a dream, Eric and Skip are hoping to get noticed at the portfolio critique sessions and land a professional design contract with one of the comics representatives. One succeeds (to the preview audience’s delight) and one learns he is a very big fish in a very small bowl, and must cultivate his talent for the greater stage. Intermingled for comic relief is the adorable story of James Darling and Se Young Kang, a couple who met and started dating at the previous year’s Con. James is planning to ask Se Young to marry him at this year’s Con, but must overcome a slew of hilarious obstacles to pull of his nerdy romantic feat. Chuck Rozanski hangs rare collectibles that he is hoping to sell on the convention floor in a scene from Comic-Con Episode IV. 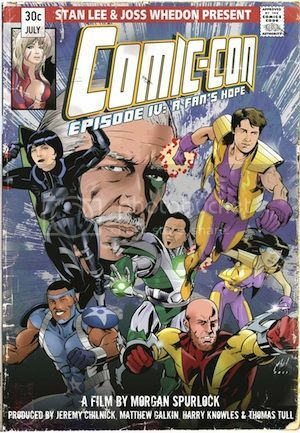 Comic-Con Episode IV: A Fan’s Hope is a terrific purview into the conflicts and dissent of the modern Con. Hidden beneath the popularity of the yearly event is a schism between older fans who have been coming for years (and feel somewhat lost in the shuffle) and the new fans, such as lovebirds James and Se Young, who may not even necessarily be there for comics events. Longtime attendees such as Kevin Smith admitted that the event has become a “beancounter” with tremendous power to preview movies and television, something Hollywood has noticed and latched onto. One can legitimately forget the presence of comics and the graphic arts at Comic-Con altogether without trying very hard. This presents a huge problem for the poignant storyline of Chuck Rozanski, with whom we empathize as he struggles to sell comics through 4-day event. When ScriptPhD.com asked Spurlock at a recent Los Angeles junket about what surprised him the most, he pointed to the sheer volume of what goes on at Comic-Con, especially the job-hunting aspect of the Comic-Con exhibition floor. His favorite moment in the movie is the comparison of Comic-Con to a Russian nesting doll, with events hidden beneath other events. “I showed the movie to people and they responded that they didn’t even know that went on at Comic-Con! There is something for everyone, no matter what your passion.” Spurlock remarked. Comic-Con Episode IV: A Fan’s Hope was released in select cities on April 5, and theaters and video on demand on April 6th.